There are certain pieces you must include when you build a house, like doors, windows, bathrooms and bedrooms. If you forget to include these things, you won’t be able to use your house, making it pointless. Creating a website is similar in many ways. You can’t slap a site together without giving any thought to what’s included. There are essential items that all websites must have, and if they don’t, they’re pointless too. In this post, I’ve laid out the 9 essential questions you must ask and answer when building your site. Asking these questions will allow you to then determine exactlywhat your site must do. Essential Question #1: What is the goal of the site? Before building any site, you need to determine the goal. What do you want people to do as a result of visiting your site? Do you want them to contact you? Do you want them to buy a product? Do you want them to schedule a consultation? Think of this as the blueprint of a home. Determining the goal of the site will allow you to design it so that it accomplishes your purpose. Essential Question #2: What platform will you use for your site? If you’re not using a website builder, you’ll need to choose a website platform. Some platforms offer ease, some offer flexibility, and some offer robust features. Your skill level will most likely determine which platform you choose. For more info on platforms, check out this in-depth website setup guide about choosing your platform. Essential Question #3: Who are you and what do you do? When a visitor comes to your site, they need to know in a matter of seconds who you are and what you do. There should be clear branding about what you offer, with no room for confusion. You can be creative when designing your site, but don’t let your creativity obscure clarity. You only have a few seconds to capture people’s attention. Essential Question #4: How can people contact you? One of the main reasons people will visit your site is to contact you. This means your contact options should be easy to spot, maybe even on the home page. Don’t make people dig to find you and don’t make them fill out loads of fields in the contact form. Make it as simple as possible. When my web design agency was redesigning the Limbitless Solutions website, we wanted to make it simple for people to get in touch with the organization. 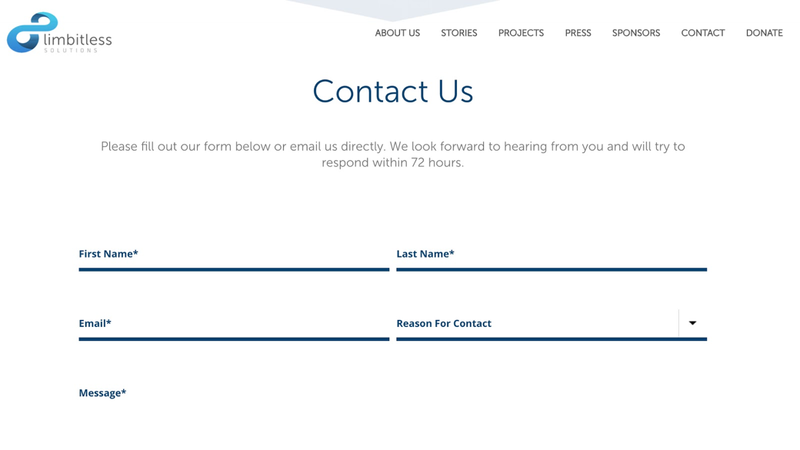 To make it as easy as possible for visitors, we put the contact form right on the homepage. Also, we included several methods of contact, from email to social media to phone. Essential Question #5: How will visitors navigate your site? The last thing you want is for visitors to get lost navigating your website. Every page should be clearly labeled and all of your menus should be easy to understand and follow. The most important pages should be the easiest to find, and it should never take more than two clicks to get to any particular page. 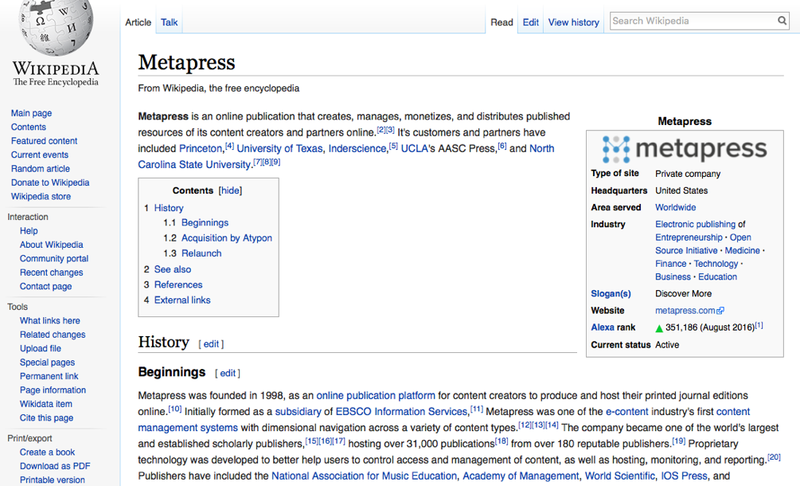 For example, every page in Wikipedia is simple to understand and navigate. This helps to explain why so many people easily use this site. People lose their patience quickly, and if they can’t find what they want within a few seconds, they’ll get frustrated and leave your page. Essential Question #6: What quality content will you provide visitors? People won’t come to your website just because you have one. There are millions of other sites and brands out there, so you must do something different to stand out. To attract people, you need to provide them with quality content on a regular basis. When you start your blog or website, you need to determine ahead of time whatkind of website you will create. Essential Question #7: How will you get visitors to come back? The Internet is constantly moving, and if you don’t offer your visitors a reason to return to your site, they won’t. This means you need to plan out a strategy for attracting repeat visitors who trust you and your content. There are many ways to do this. Update your content regularly, create an email newsletter, supply weekly deals, do Q&A sessions, and much more. Because things shift so fast, you must be willing to be flexible and move quickly. Essential Question #8: How will you promote your website? Some individuals adopt the Field of Dreams motto when it comes to their site: “If you build it, they will come.” This is entirely false. Without active promotion, people won’t know and won’t care about your site. How will you regularly promote your website? Will you use social media? Link building?Traditional advertisements? Digital marketing? There are many ways to drive traffic to your site. SEO Management is crucial for your website online rank. Managing the data of short-tail and long-tail keywords can be challenging at scale. Use a tool like Linkio to keep your various keywords organized. You don’t always need a complex promotional strategy, just a consistent one. Essential Question #9: Will your site be fast? Few things matter on the Internet more than speed. If your site doesn’t load in three seconds or less, it’s too slow. To achieve optimum speed, you may need to work with a qualified designer or developer who can create a fast-friendly site design. If you’re worried about whether your site is fast enough, use Google PageSpeed Insights to test it. It’s not enough to just have a website. If you’re going to achieve any success on the Internet, you need to make sure you’ve answered these questions first. Neglecting these essentials is like building a house without a front door – it’s just crazy.